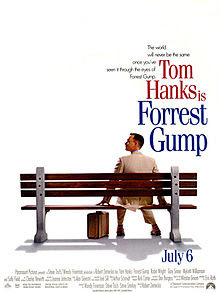 Forrest Gump was the top grossing film in North America in 1994. Directed by Robert Zemeckis (1051) of Back to the Future and Who Framed Roger Rabbit fame. Deservedly, Zemeckis received the Academy Award for Best Director for Forrest Gump. But mostly it is unforgettable because of its contents rather loosely based on the book by the same name written by the American writer Winston Groom (1944). Groom was born in Alabama and intimately knows the places and folks where the movie Forrest Gump was largely filmed. 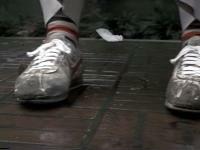 The feather is leading visual and symbolic theme in Forrest Gump. The movie begins with the camera following a seemingly random flight of a feather which is then picked by Forrest and it ends with the feather flying in the wind. This is movie magic, powerful imagery and conveys a subtle but clear message about life of the Vietnam generation living in the United States of America. The flying feather conveys a feeling of life that is rather randomly pushed by the anonymous forces of Destiny and how people react in the midst of all this that is happening to them and to the people near them. The freely flying feather does not suggest purpose in human experience. It places emphasis on the external events into which Forrest Gump rather randomly wanders as by chance. The situations are often comic and depicted in truly hilarious ways but always with dignity and underlying seriousness. Even when poking fun on the Shroud of Veronica. The way Tom Hanks act Forrest is a valuable and lasting statement about the value of every human being and the dignity of even the simplest and most naive people among us. Hanks performance emphasizes the humanity and surprising depth of feeling and morality of also mentally handicapped. And the potential of physically handicapped to influence even someone like Elvis Presley! But is life really like the random box of chocolates, humans driven by the winds of Destiny? For the movie itself is carefully planned and guides Forrest from significant event to another allowing us to see the fundamental human values that are guiding his life. Even the theme is a feather driven in the wind the realization is a carefully crafted life of a human being surviving and flourishing and inspiring others to survive and flourish. So... personally I believe that also our real life outside the movie theatres is not randomly driven by the winds of Fate. It is also not carefully crafted by some invisible Movie Director as if we have no role in it. The Son of God does not rule us over our will but rather wants to walk with us through the tribunals, losses and victories of life, in health and sickness, in war and peace, in life and death. As our true Friend. What I personally like most about the movie Forrest Gump is the value it gives to the power of love.